I think it sounds like everyone likes the scrappy color way for our April snowball blocks the best. The snowballs are comprised of solid or tone on tone neutrals with scrappy corners to complete the blocks. Rather than one 12 inch block, this month we will make 4 - 6.5" blocks. I opted for smaller scale prints for mine and was happy to find everything I needed in my scrap bins. I used this tutorial from the St. Croix Quilters website. They show the snowball blocks alternated with nine patch blocks which would be a great scrap quilt. And these are my bonus HSTs from making the blocks. I'm sure many of you do this already, but I thought I'd share just in case. From my diagonal snowball corner stitching, I stitched a second line 1/2 further out towards the corner. Then I cut between the stitching to yield my snowball block and 4 little bonus HSTs per block. I do this whenever I have blocks like these or flying geese and have a large jar I stuff them into...they are nice to have on hand for making mug rugs and potholders. And don't forget to share a photo of your blocks in our flickr group....it's always fun to see what you could win! Thanks to everyone who attended the meeting last Thursday. Here's a recap of the meeting for those of you who were not able to attend. Exciting news! Sewtropolis is moving to a new location. Our next meeting is April 19th at the new store, located at 4755 Chicago Ave S., in South Minneapolis. Please bring a snack or beverage to share in honor of Nikol's new digs and our new meeting space! A fat 1/8th swap. Since the challenge includes so many colors, we agreed it would be helpful to do a fabric swap. If you wish to participate in the swap, please send me an e-mail and I will assign you a color. You may choose a print or a solid in the color I assign you. Cut 1 yard into fat 1/8ths and bring it to the April meeting for the swap. As a reminder, the colors are: tangerine, gold, citrine, lime, aqua, turquoise, white, and gray). Make one block of your own design (although you are allowed to submit up to 3 to the challenge) to send to Elizabeth Hartman made from the swap fabrics (or your own). Make five more blocks of the same pattern in the fabrics of your choice. These blocks must be 12.5" square. As a group we will piece the extra blocks together to make charity quilts. Flaun filled us in on the latest details on our impending visit from Jacquie of Tall Grass Prairie Studio. We agreed that we'd love to have a full day class with her but weren't exactly sure what we would like her to cover. 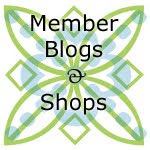 Please take a look at her blog and do a bit of brainstorming for the next meeting. The tentative date for the book signing is September 13th. Flaun, please add anything that I may have missed. We would like to close down our Big Tent site. Between this blog, Facebook, and our Flickr group, it feels like our online needs covered. Marie is going to look into deleting the Big Tent group. We chatted a bit about this blog, too. We decided to add a section to list member's online shops, Etsy or stand alone. If you have a shop, please send me the link and your logo (if you have one) and I'll get it set up. If you have a blog and you consider yourself a member of the MMQG, please add a link to this blog and spread the love around. We don't have a button yet, but I'll put one together as soon as our graphic design work is done. And speaking of graphic design, Tracy's daughter hasn't had time to work on our logo, but we certainly appreciate the time she's put in so far. If anyone knows of a graphic designer who might be interested in doing a logo for us in return for a quilt, please let us know. Finally, we talked briefly about our blog hop concept. If memory serves me correctly, we talked about featuring block tutorials as we hop from one blog to another in May/June. New member Charlot was the winner of our 36 patch block lotto. Congratulations Charlot! All the blocks looked gorgeous together. Ahuge thank you to Karen for writing such a concise and easy to follow tutorial. The group was nearly unanimous in voting for scrappy snowball blocks with a neutral center for our April lotto. Nikol suggested doing granny square blocks for our May lotto. I suggested doing a swap (or "cookie exchange") just to change things up a little. Make 12 granny square blocks. Save one for yourself and swap the other 11. Each person goes home with enough blocks to make a quilt. Flaun knows of a strip piecing tutorial and will share it with us. While I didn't mention it at the meeting, I think it would be wonderful to use reproduction prints. Thoughts? As for future block lotto ideas, Marie mentioned the Antique Tile block from the Fresh Lemons blog. Thanks to smart phones, we were able to see the block and agreed we loved it, so let's add it to our list for a future month. The name tags were amazing! Please post a photo of your name tag on our Flickr group if you have time. I have name tags for Karen and Lisa and I'll bring them to the next meeting. Didn't get a name tag? Maybe we should choose names and do a second round for people who missed the February meeting. Amazing, as always. What a talented group we have! For our April block we chose a snowball block and a neutral color scheme was suggested. I experimented a bit with some color options for everyone to consider. Totally random usage of neutrals didn't really show off the block pattern. The quilt above uses light neutrals for the snowballs and dark neutrals for the corners. Below uses light neutrals for the snowballs and one color for the corners...we'd just have to agree on a color. In substituting different colors in, I thought red was one of the better options. And this last quilt is a combination of neutral snowballs with bright and scrappy corners. To participate in the April block drawing we will each make 4 - 6" snowball blocks in the chosen color scheme. So what do you think? Which option do you choose? Jacquie from Tall Grass Prairie Studio Blog. Flaun has been talking with her about a possible visit in September. Everyone likes the idea, but would like more information about cost, timing etc. from Jacquie, Flaun will follow up with her. In the meantime, Nikol will ask the Textile center about space. Blog hop for those of us who have blogs. Again, everyone likes the idea, but we will hold off until April. Name tags: We decided the best way to get our name tags done was to have someone else make them for us. So we all drew names out and will make a name tag for the person. Due date: March meeting. Block Lotto: Tracy won the Block Lotto. New rule: Once you win the Lotto you can not enter again until you finish a quilt using the Lotto blocks you won. Green Challenge: Vanessa reminded everyone that April is the reveal for the Green Quilt Challenge. Make a quilt using only repurposed items. Blog: Annik created a blog for us using Blogspot! Everyone loves likes the idea of having a blog, but as we grow we want to make sure we start out using the correct blogging network. (wordpress or blogspot). We were going to do a little research (pro/con) of using each and decide at the next meeting. Next meeting: March 15, 6:30 – 8p. Sewtroplis, 5 West Diamond Lake Road, S. Mpls. See you all then!